One Sunday morning in 1981, four prominent Labour politicians gather in private at Owen’s home in Limehouse, east London. The ‘Gang of Four’ are desperate to find a political alternative after the Labour Party committed to unilateral nuclear disarmament and withdrawal from the European Economic Community. Labour had become too left-wing, and Prime Minister Margaret Thatcher’s austere economic and public-spending policies were disastrous. Despite the risk of undermining the Labour Party (to say nothing of the whole political system), the Gang made the monumental decision to break away and form the Social Democratic Party (SDP). The Gang of Four: who are they? Roy Jenkins (1920 – 2003): First and so far only British president of the European Commission. He was the prime mover in the creation of the SDP, and its first leader. Though he never became prime minister, his brief incumbency in the Home Office during the late Sixties coincided with a series of reforms to the laws concerning homosexuality, divorce, abortion and race relations that changed the nature of Britain almost overnight. Jenkins became chancellor of Oxford University, and was awarded the Order of Merit. He was also an accomplished writer and award-winning journalist: best known for his autobiography A Life At The Centre, and his biographies Gladstone and Churchill. He liked good wine, good food, good talk, good books and fiercely competitive croquet. Bill Rodgers (1928 -): In 1971 Rodgers acted as whip for the pro-European group of Labour MPs, led by Roy Jenkins, and played a leading part in the Yes Campaign in the 1975 Referendum on Europe. He was MP for Stockton-On-Tees, Transport Secretary and Lib Dem leader in the House of Lords. In 1987 he was appointed Director General of the Royal Institute of British Architects. Although less in the public eye than the others, he was a crucial member of the Gang of Four. 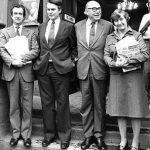 Shirley Williams (1930 -): Began her career as a journalist with the Daily Mirror and Financial Times before becoming General Secretary of the Fabian Society, a post which she held until being elected as Labour MP in 1964. Shadow Home Secretary and then Education Secretary and Paymaster General, Williams was increasingly in a small minority on policy issues on which she felt particularly strongly – Europe, defence, internal party democracy – she resigned to become one of the Gang of Four. In 1982 she became SDP President, a position she held throughout the party’s independent existence. An early supporter of the Alliance with the Liberal Party, she was at odds with the style and substance of David Owen’s leadership and their relationship became one of open hostility. Her interest in employment policy, particularly youth unemployment, is reflected in her many publications on the topic. David Owen (1938 -): Educated as a physician, he nevertheless chose to pursue a political career and was member of Parliament for Plymouth from 1966-92. Under Labour Governments, he served as Navy Minister, Health Minister and Foreign Secretary. Owen was the leader of SDF from 1983-87 and 1988-90. He was Chairman of New Europe from 1999-2005, a cross party organisation that successfully campaigned against the UK adopting the euro and campaigned for Vote Leave in the EU referendum, believing that the EU had become dysfunctional. Owen was Chancellor of Liverpool University from 1996-2009 and is the author of numerous publications in the field of health and politics. Renowned for his documentary-style theatre, Steve Waters’ new drama takes us behind closed doors to imagine the personal conflicts behind the making of modern political history. 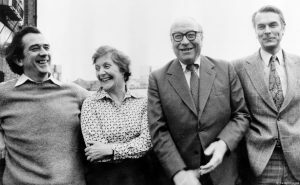 Cast includes Roger Allam as Roy Jenkins and Tom Goodman-Hill as David Owen, Paul Chahidi as Bill Rogers and Debra Gillett as Shirley Williams. Nathalie Armin will play Debbie Owen, wife of David Owen and co-host of that momentous day in east London. The production is directed by Olivier Award-winning Polly Findlay, who makes her Donmar debut. 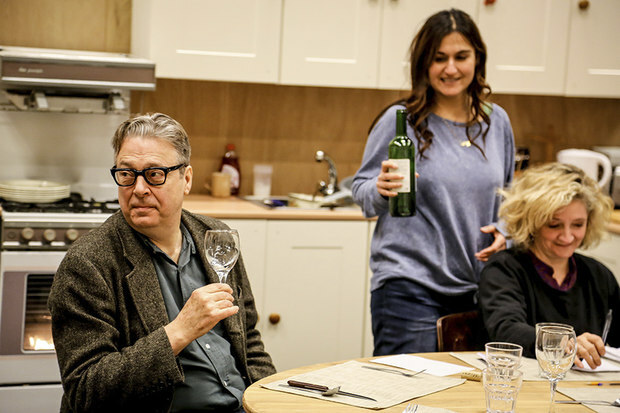 Limehouse is part of the Donmar Warehouse’s potently pertinent themed Power Season, and is almost sold out, but some tickets will be made available every week from 20 February via KLAXON tickets. The play runs from 2 March to 15 April 2017.